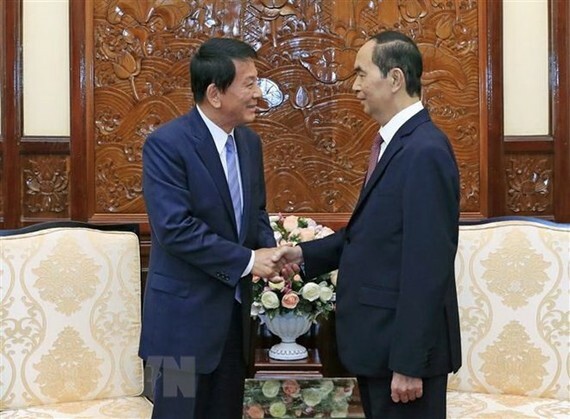 President Tran Dai Quang received visiting Vietnam-Japan and Japan-Vietnam Special Ambassador Ryotaro Sugi in Hanoi on September 6. At the reception, the State leader noted with pleasure the strong and practical development of the Vietnam-Japan extensive strategic partnership in all fields, with increased exchanges and political trust between high-ranking leaders. Visits by and meetings between the two countries’ high-ranking leaders, including the State visit to Vietnam by the Japanese Emperor and Empress in March 2017 and the State visit to Japan by President Quang and his spouse from May 29 to June 2, have opened up a new development stage for the Vietnam-Japan relationship in a more comprehensive and pragmatic manner. As 2018 marks the 45th anniversary of bilateral diplomatic ties, the two nations have been organised a wide range of significant activities, contributing to fostering the political understanding and trust, economic cooperation, and people-to-people exchange between Vietnam and Japan, President Quang said. He spoke highly of the ambassador’s positive contributions to the bilateral relations over the past over 30 years via meaningful activities, especially those in the fields of culture, arts and people-to-people exchange. Ryotaro Sugi’s activities have actively contributed to enhancing mutual understanding about the people and culture of Vietnam and Japan, creating a firm foundation for consolidating the friendship and collaboration between the Vietnamese and Japanese people, he said. 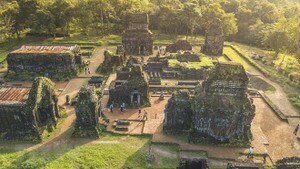 President Quang wished that the ambassador will have more practical initiatives and activities to foster the extensive strategic partnership between the two nations, especially in culture, arts, people-to-people exchange, and locality-to-locality cooperation, as well as promote the image of Vietnam in Japan. He asked Ryotaro Sugi to support the Vietnamese Embassy in Japan in boosting bilateral cooperation in fields of both countries’ strength like agriculture, labour and health. As the ambassador will work with Vietnamese ministries and agencies to organise the Vietnam-Japan Music Festival 2018 in celebration of the 45th anniversary of bilateral diplomatic ties on September 9, the President expressed his belief that the programme will be a success, thus bolstering the collaboration and people-to-people exchange between the two countries. For his part, Ryotaro Sugi said he is delighted at the development of Japan-Vietnam relations over the past time, especially after the State visit to Vietnam by the Japanese Emperor and Empress and the State visit to Japan by President Quang and his spouse. He said he has received close coordination from the Ministry of Culture, Sports and Tourism and the Vietnam Television in organising the Vietnam-Japan Music Festival 2018. He affirmed that he will do his utmost to foster the Japan-Vietnam relationship.